Turkey's ruling party begins deliberations on the shape of the next government on Monday after Prime Minister Tayyip Erdogan secured his place in history by winning the nation's first direct presidential election. Erdogan's victory in Sunday's vote takes him a step closer to the executive presidency he has long coveted for Turkey. In the coming weeks, Erdogan will for the last time chair meetings of the ruling AK Party he founded and oversee the selection of a new party leader, likely to be a future prime minister. He will be inaugurated on Aug. 28. 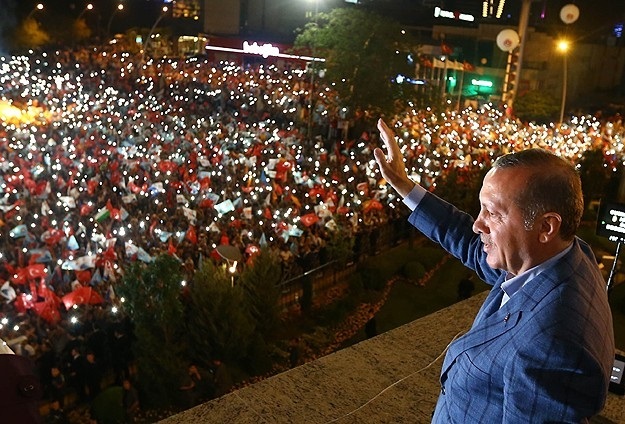 "Today is a new day, a milestone for Turkey, the birthday of Turkey, of its rebirth from the ashes," Erdogan, 60, told thousands of supporters in a victory speech from the balcony of the AK Party headquarters in Ankara late on Sunday. Supporters honking car horns and waving flags took to the streets in Ankara after results on Turkish television said Erdogan, the prime minister for more than a decade, had won 52 percent of the vote. The celebratory mood filled the front pages of pro-government newspapers. "The People's Revolution", said a banner headline in the Aksam daily above a picture of Erdogan waving to the crowds overnight. Other headlines spelled out: "Erdogan's historic triumph", "The People's President". Investors initially welcomed the result on hopes that it would ensure political stability, after nearly 12 years of AK Party rule. The lira rallied to 2.1385 against the dollar from 2.1601 late on Friday. However, some said the market reaction could be short-lived. "We expect the market will refocus on the composition of the cabinet," said Phoenix Kalen, a London-based strategist at Societe Generale, warning there could be "investor concern over the future trajectory of economic policy-making". It was a narrower margin of victory than polls had suggested but still 13 points more than Erdogan's closest rival, and comfortable enough to avoid the need for a second round runoff. The chairman of the High Election Board confirmed Erdogan had a majority, with more than 99 percent of votes counted, and said full provisional figures would be released later on Monday. Erdogan has vowed to exercise the full powers granted to the presidency under current laws, unlike predecessors who played a mainly ceremonial role. But he has made no secret of his plans to change the 'coup' constitution and forge an executive presidency. "I want to underline that I will be the president of all 77 million people, not only those who voted for me. I will be a president who works for the flag, for the country, for the people," he said in his victory speech. The electoral map suggested that might not be easy. While the expanses of the conservative Anatolian heartlands voted overwhelmingly for Erdogan, the more liberal western Aegean and Mediterranean coastal fringe was dominated by main opposition candidate Ekmeleddin Ihsanoglu, and the southeastern corner by Kurdish candidate Selahattin Demirtas. Turkey has emerged as a regional economic force under Erdogan and few investors had doubted the outcome. "This was more of a coronation than an election, with the result preordained quite some time ago," said Nicholas Spiro, managing director of London-based Spiro Sovereign Strategy. But in the long term, there are concerns about concentration of power in the hands of a sometimes impulsive leader. "Mr Erdogan continues to dominate Turkey's political scene and is eager to turn the presidency into an executive, hands-on role. He called the shots as premier and he will keep calling the shots as president," Spiro said. 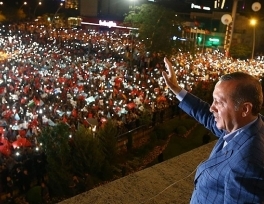 "Turkey's next premier will govern in Mr Erdogan's shadow." Ihsanoglu, a former diplomat and academic who won 38.5 percent of the vote according to broadcasters CNN Turk and NTV, congratulated Erdogan on the result in a brief statement. It will be vital for Erdogan to have a loyal prime minister. Under the constitution, he will have to break with the AK Party before he is inaugurated in a little over two weeks' time. Should his influence over the party wane, Erdogan could struggle to force through the constitutional changes he wants to create an executive presidency, a reform which requires either a two-thirds majority in parliament or a popular vote. "In a few days when the official results are announced, the prime minister's relationship with the party and the parliament will be over," Deputy Prime Minister Bulent Arinc told reporters in Ankara late on Sunday. "You will of course ask who will be prime minister and the leader of the party. Starting from tonight, I know that there will be work done on this front," he said. Senior AK officials say foreign minister Ahmet Davutoglu, who has strong support within the party bureaucracy and has been Erdogan's right-hand man internationally, is the top choice to succeed him, although former transport minister Binali Yildirim is also trying to position himself for the job. Erdogan's critics fear a supine prime minister will leave him too powerful, and erode the presidency's traditional role as a check on the powers of the executive. His backers dismiss such concerns, arguing Turkey needs strong leadership.